Welcome to my new series: Blogging Better! Each week I hope to come up with relevant and fun topics to help you become a better blogger. I originally started this series in my weekly newsletter but I thought it would be more fun to open it up to all blog readers. 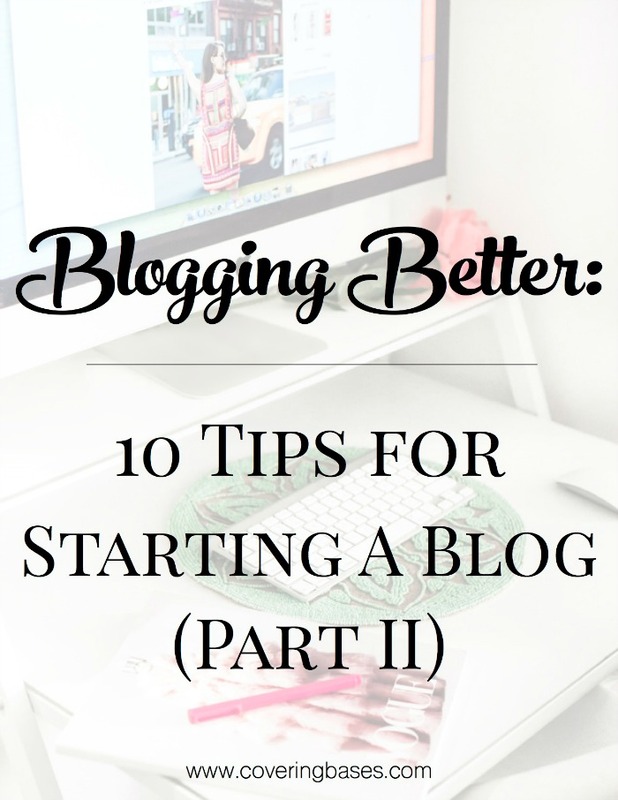 Last week, we started with 10 tips for starting your blog. Since the post was so long, I decided it was best to break it up into two parts. Now that you’ve started your blog and are starting to publish content, what’s next? When you first start out (for the most part) your only readers will be your family and friends. We’ve all been there, and this is honestly how everyone gets their start. Word of mouth is the best way to get your feet on the ground. Friends and family are the people who will always support you and be your most loyal blog readers in the beginning. I think my mom still tells anyone she knows about my blog. But I’m not complaining because every little bit helps and it’s always nice to have a support system. Their friends will tell their friends, the telephone game begins and just keeps going down the line. Along with sharing your content with family and friends, share it with your social media followers. They chose to follow your life so why not take advantage of a following that’s already built? One of my most asked questions from people starting a new blog and sharing content socially is if they should make separate social accounts for their blog. I don’t believe there is a hard and fast rule on this topic but I can help better explain some pros and cons for each. Pros: You’ll have more engaged followers because the people following you know that the only thing they’ll get out of it is blog content. You also won’t lose as many followers over time since they chose to follow you for your content. Cons: You’re now overseeing a lot of different accounts and it can get overwhelming! It’s hard to remember to put content out on each of the accounts you manage. Pros: You already have a following. In all reality, the hardest part is getting people to your page. Why not leverage the friends you already have to start spreading the word? You just keep doing what you’re doing and sprinkle in some blog content so it’s not very overwhelming. Cons: There will come a time when either your blog or your personal life takes over and you’ll start a separate account for your work friends (guilty). Blog followers don’t want to see your drunk photos at night and your friends don’t want to see your 10th selfie that day. You’ll create a second account but never really use it (at least that’s how I am). Now of course all of the above talk is mainly focused on Twitter and Instagram. For Facebook you’ll obviously create a new business page, and for Pinterest it won’t truly matter. We’ll talk more about how to promote your blog on different social accounts in the coming weeks! I feel like a lot of people struggle with this online. They see someone with great success and they copy them thinking they’ll also be successful. It's the “if it works for one person it must work for me” kind of mentality. But this is so far from the truth it hurts! Remember last week the first tip talked about standing apart from the rest? Why would someone want to just see another carbon copy blogger? You need to stay true to yourself online – what you like, what you wear, how you feel, how you write – everything! Staying true to yourself is what keeps the followers coming back for more. Not going to lie, blogging can be really rough sometimes. Between online negativity and comparing yourself to others, blogging can really get to you. I still catch myself making comparisons to others and that’s when you get down in the dumps. Blogging also doesn’t ever really have an end date. But my key to getting through all of this is to focus on yourself and keep doing what you’re doing. Also be sure to remember that success does NOT come overnight. You’re not going to start a blog and instantly start making money or working with brands. You’re going to have to fight and really put everything you have into making this blog a success. You’re going to have to power through hard times. There will be a light at the end of the tunnel. My last tip for starting a blog is to go slow. There are so many things you can do to really make your blog great, but when you do them all at once you can get stressed and eventually burn yourself out. Take it step by step, day by day and really set time aside to focus on one thing at a time. You should be thinking of doing one or two things really well and then doing 10 things just "ok." Set your sights and goals high, but know it takes dedication and focus to complete each step. Check back next week for part two of Blogging Better: How To Take the Perfect Blog Photo. If you have any questions or topics you'd like covered in this series, please let me know down below! I love this! It is so helpful, I just started blogging and I am really excited to see where it takes me! Thanks so much for the great tips! Such great tips - thanks for sharing! I love your blog! Search Engines love videos! – It is safe to say that in general, videos do tend to get ranked higher than regular pages with written text and images. They can go viral – Videos have a viral quality, meaning that they can spread and grow faster and faster just without you having to even actively promote them.